Click on a location from the map above. Only the first page of each garden area can be accessed from the map; to view the entire garden, use the index below or take the tour. This website was developed in 1999 and is regularly updated. 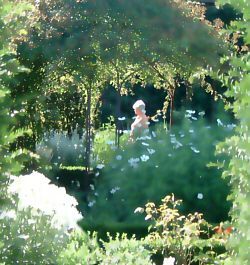 Sissinghurst Garden is in the Weald of Kent, near Cranbrook, Goudhurst and Tenterden. It is close to landscape designated of outstanding natural beauty. The property is owned and maintained by the National Trust. The garden was created by Vita Sackville-West & Harold Nicolson in the 1930's. At this time, the site was very run down. The site is ancient - its name is Saxon - meaning 'clearing in the woods'. A stone manor surrounded by a moat was built in the Middle Ages. Two legs of the moat survive - a third leg originally ran where the 'Moat Walk' lawn is now. The original building was replaced in the 15th century by a large manor built by the Baker family - related by marriage to the Sackvilles of Knowle. It was let to the Government between 1756 and 1763 as a prison camp for French prisoners-of-war. The prisoners were badly treated - as was the site generally, and much was demolished. "These mild gentlemen and women who invade one's garden after putting their silver token into the bowl ... are some of the people I most gladly welcome and salute. Between them and myself a particular form of courtesy survives, a gardener's courtesy, in a world where courtesy is giving place to rougher things"
The garden is in fact a series of some ten separate gardens, all delightfully different. Walls and hedges separate the gardens, giving the visitor the impression of peace and seclusion. On a sunny day there is almost nowhere better to be.